Escalating land prices in Mumbai is forcing out the families that serve the privileged classes. The domestic help, drivers, sweepers, peons etc are the invisible cogs that daily ensure smooth running of the city. 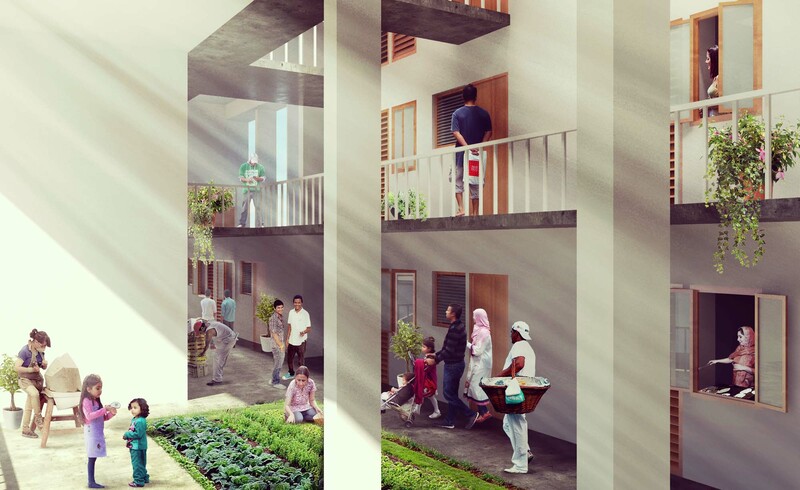 Currently they are being dis-housed from their decades old housing, since this has caught the eye of developers; and they are forced to relocate further from their primary sources of income. Currently, this segment forms 50-60 % of the urban population of Mumbai. The commute between home and work thus becomes a critical factor in site selection. If this isn’t handled adequately (eg, the commute is a 2hr+ journey each way), the new homes get rented out and the people return to squat closer to their places of work. for the large service sector population. This should also have the capacity to grow incrementally as these new settlements grow in popularity. records, can be identified, procured and ear marked, the entire project can develop in tandem with the MRTS network. 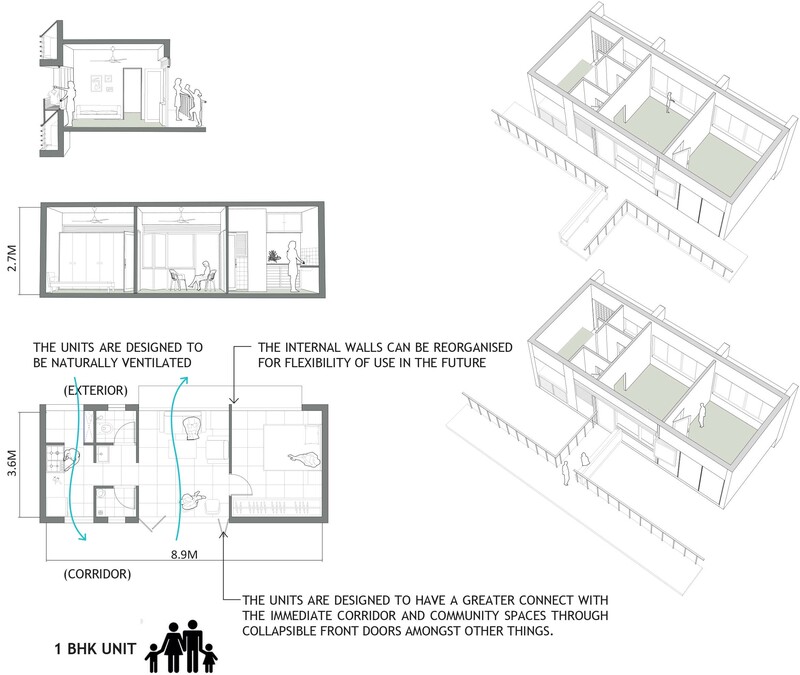 C. Design- a modular, but non-repetitive scheme, with a mix of 1 Room Kitchen (RK) and 1 Bedroom Kitchen (BHK), which can be combined to form permutations suiting the fluid requirements of users, with a minimum area of 300sq.ft as mandated. 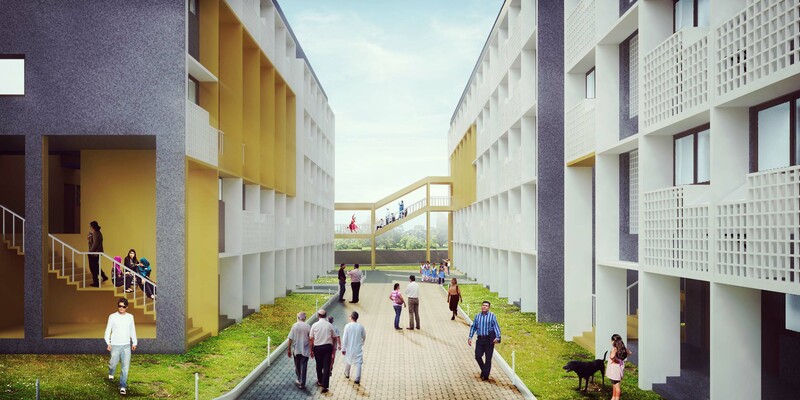 A 19770 sq.mt plot is within 10 minutes walking distance from Bhivpuri station, Karjat. This is on the Central railway route between Neral and Karjat. 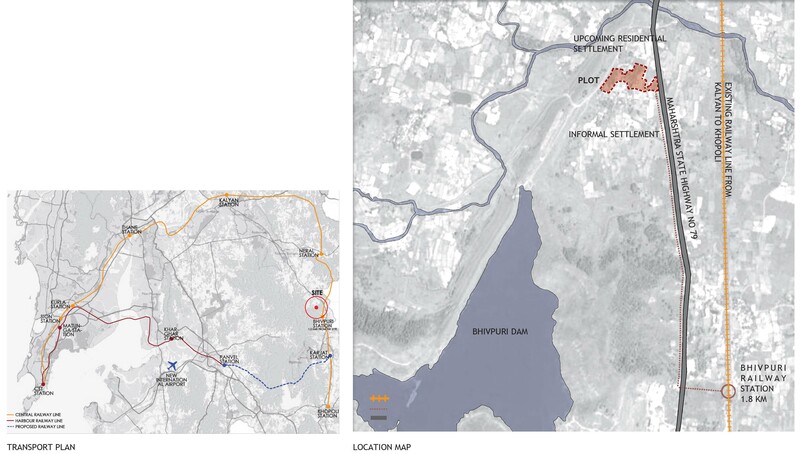 It is also connected to NH4 and has road links to both Panvel/Navi Mumbai and Badlapur/Thane. The approach explores the flexibility available in clever repetition of a module. 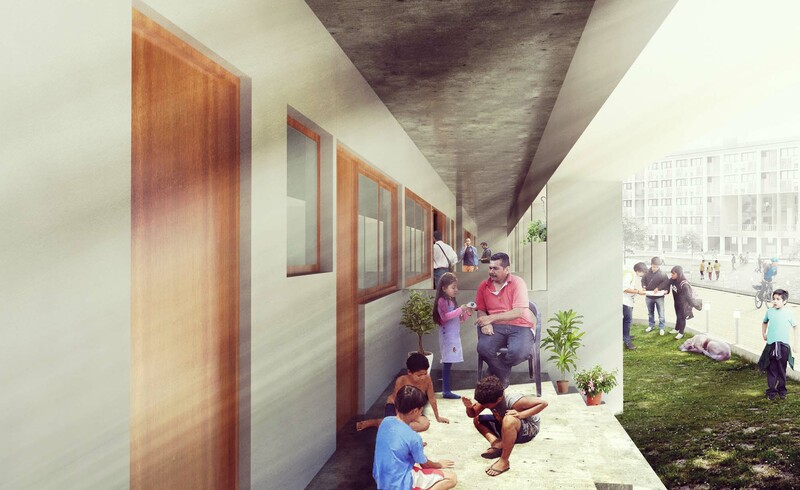 The project, being precast pods, can be executed with speed and allows for a number of units that can be configured to suit individual requirements of space for individual families over time. 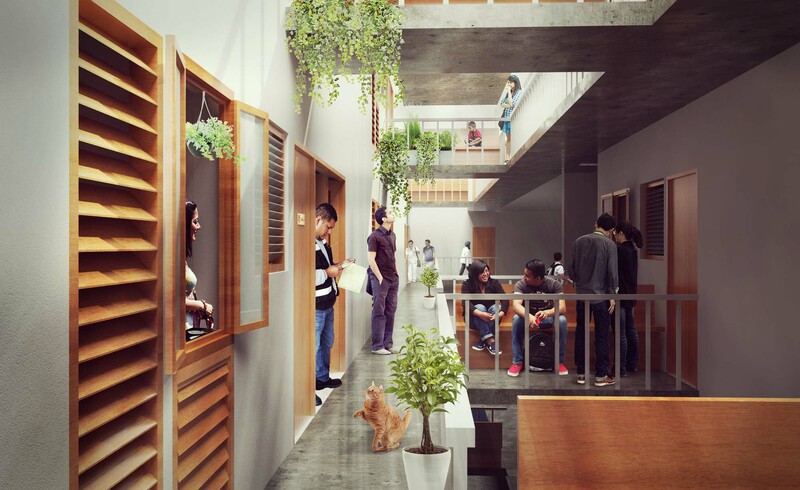 At the same time, rather than consolidating the 10% amenity into the de-facto club house disconnected from daily use, the design integrated it as a series of dispersed common social programs throughout the building. Since residents would pass by these on a regular day to day basis, the chance of these being maintained well were also much higher. Being a low-rise building the users experience a closer connection to the ground. 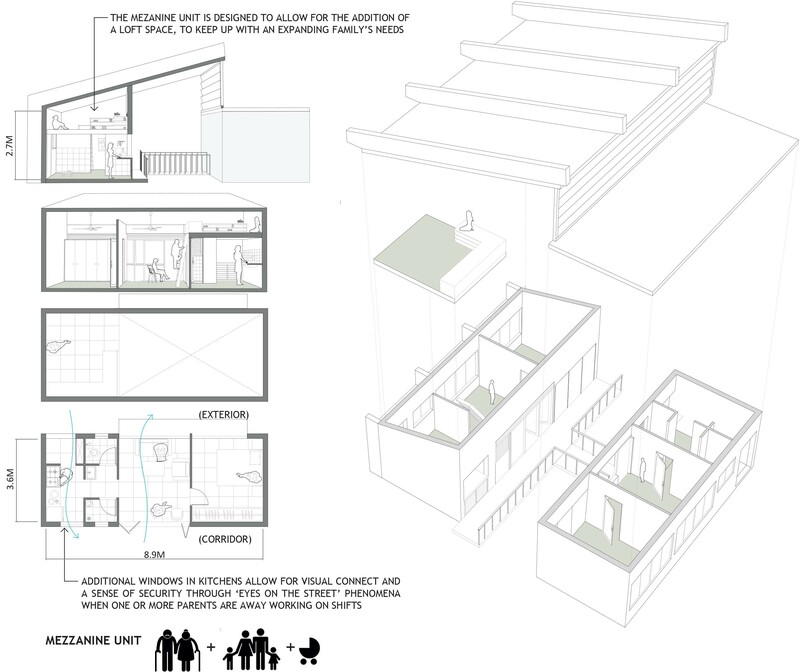 Unit Design– Many iterations to the 300 sq.ft unit finally led to a module that served the requirements of a low income, yet upwardly mobile family. 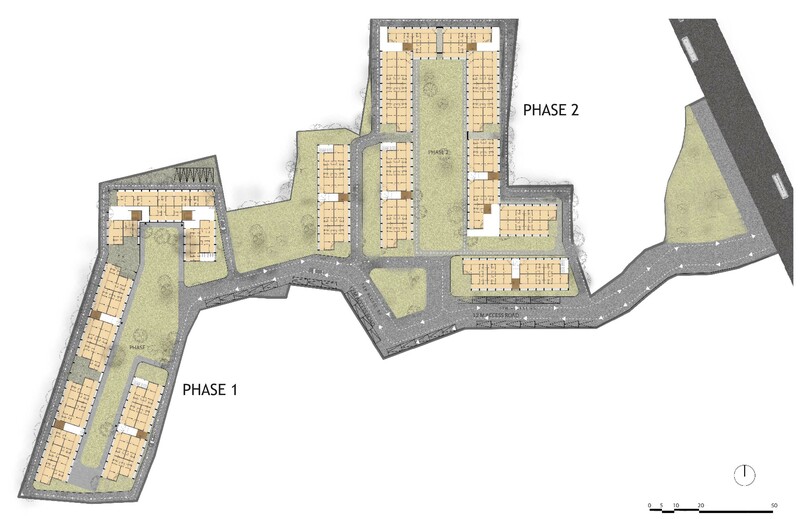 Learning from the research into indigenous housing typologies, for migrant workers in Mumbai, led to four variant designs based on the same grid. Each satisfied the requirements of a particular type of family. All the unit types are clubbed together in the same building, allowing a mix of user groups and creating a richer social fabric. All units have an identical width of 3.6mt (approx 12ft) which is generated by the Wet Pod requirements 3.6×1.5m. 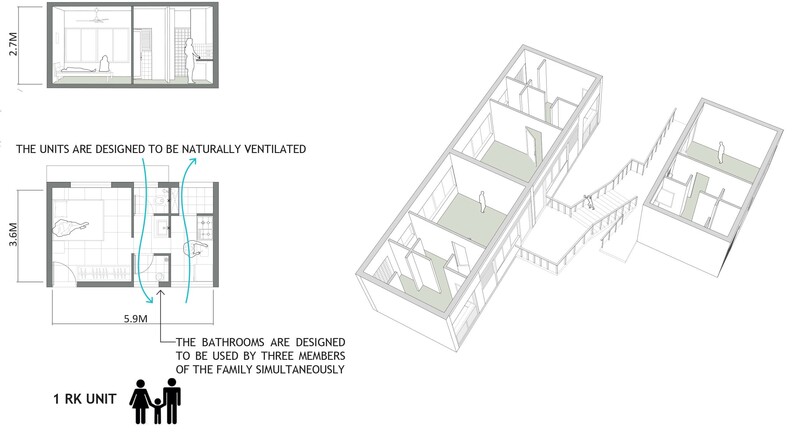 The individual unit is scalable by joining adjacent units when the family scales up in size and economics. The precast building technology ensures that the building phases can be scaled up with minimum disruption to the existing structure. The design is modular. The Wet Pods also act as structural, precast, loadbearing modules between which the slabs are spanned and eliminate the need for extra columns and beams. Since part of the building module is fabricated off-site and simply put into place on site, the actual time taken for construction is much less than a conventional RCC framed one both in terms of time and labour involved. Different techniques of precast technology were explored before settling for the load bearing, precast pod system. Through this method, we are able to build upto G+4 in 21 days as opposed to casting one slab in 21 days using conventional RCC frame construction. The precast method of construction also has the potential for production at an industrial scale with integrated basic services.